Unless you’ve been living in a cave for the last few months, it can’t have escaped your attention that Paul Newman’s legendary Rolex Cosmograph Daytona is about to hit the auction stand in New York, with some industry experts predicting it will break all known records and become the most expensive Rolex ever sold. To do that, it will have to outshine the Bao Dai ref. 6062 belonging to the last emperor of the Nguyen dynasty in Vietnam that achieved a staggering $5 million earlier this year. So, how could that watch, a one-of-a-kind, diamond-enhanced piece belonging to bona fide royalty, potentially be beaten into second place by a comparatively mass produced example that Rolex was struggling to even give away when it was introduced in the late sixties? The answer, of course, is the original owner. 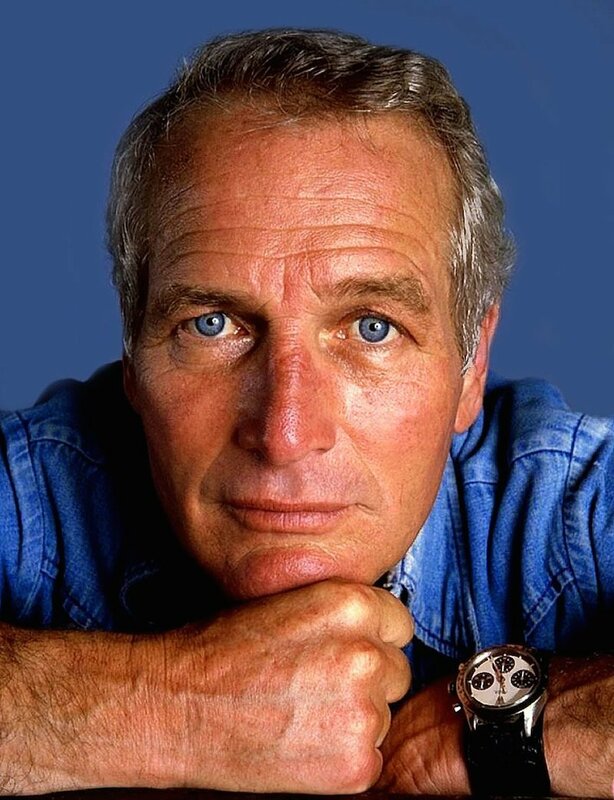 If there was ever a perfect embodiment of a watch’s character, Paul Newman. With his insouciant good looks, understated masculinity and hard working intelligence, he was the living personification of everything Rolex poured into the Daytona. That first generation ref. 6239, given to Newman by his wife Joanne Woodward to mark the start of his professional motor racing career in 1972, has been cited as launching the vintage watch market as we know it today. 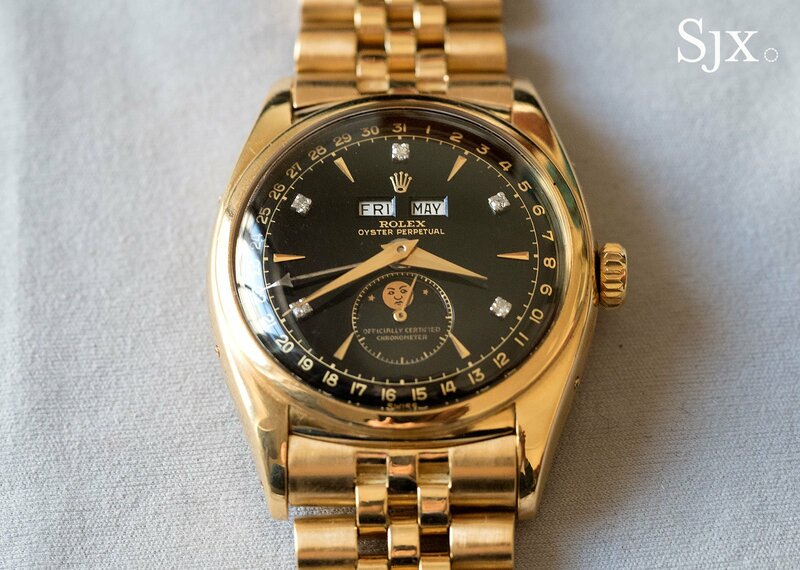 The six ‘exotic dial’ references collectively known as the Paul Newman Daytonas are now the most sought after and valuable pieces in circulation. The distinctive, multi-colored faces and Art Deco styling that once sat gathering dust on shelves in favor of more traditional dials now change hands for astronomical sums. Paul Newman’s very own Daytona will be up for auction. The mythical example going under the hammer on October 26th, in Phillips’ maiden New York auction, is the first Daytona to be sold that was worn by the man himself. Will it break the record? Time alone will tell. For now, let’s take a quick look at what might just be the most important vintage watch in the world. Paul Newman started a life-long love affair with motor racing during the filming of the 1969 movie Winning. While it was ultimately a somewhat forgettable outing, it ignited a passion for the sport that saw him turn pro three years later after training with the likes of double Indianapolis 500 winner Roger Ward. Before long, Newman was scheduling his movies around races, preferring the genuine excitement of the track to the phoniness of Hollywood. And he was no slouch. He finished fifth in the Daytona 24-hours in 1977 and second at Le Mans two years later. He still holds the record for the oldest driver to win an officially sanctioned race when, in 1995 at age 70, he was co-driver for the winning team at the Rolex 24-hour race. 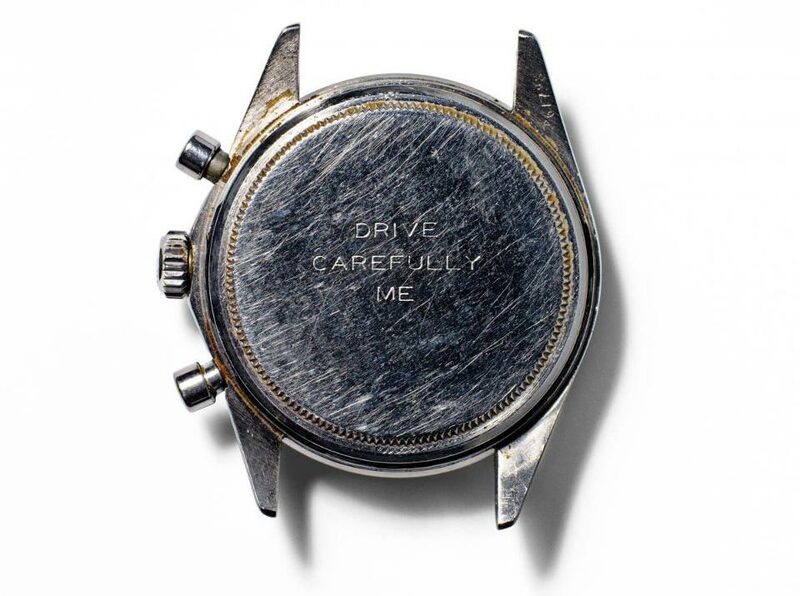 That legendary watch, lovingly engraved on the back with ‘Drive Carefully, Me’ by his anxious spouse, accompanied him as a good luck charm throughout his early career until the mid-eighties. Engraved on the back of Paul Newman’s Paul Newman has the words “DRIVE CAREFULLY ME”. There’s always been a gentle debate amongst collectors over where Woodward bought the watch. The majority agrees the likely place would be Tiffany’s in New York, although there’s no marking anywhere to be seen. She would have parted with around $300 for what is now an almost priceless object, and the vendor would have been grateful to take it. 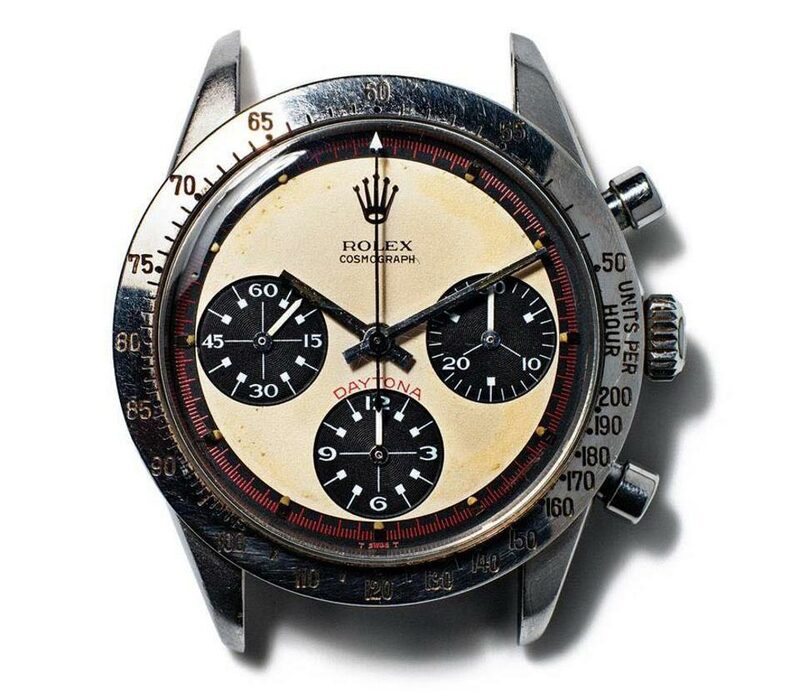 Daytonas, especially exotic dial versions, were difficult to shift. Newman owned a total of six Daytona watches over the years. As well as that original 6239, the other references that qualify to bear his name are the 6241, 6262, 6263, 6264 and 6265. Those other five watches, all with the specific dial color combinations and red detailing that gives vintage collectors palpitations, are still in the safe keeping of the family. So how has the original ended up going to auction? As a story, it says a great deal about Paul Newman. In the summer of 1984, James Cox, one-time beau of Newman’s daughter Nell, was vacationing at the family home in Westport, Connecticut. He lent the actor a hand to fix up the treehouse in the gardens that the Newman children had played in growing up and where Newman himself would sit to learn movie scripts. Cox wore it without a second thought, and oblivious to its fabled reputation, every day for more than a decade before a collector spotted it on his wrist and clued him in. By 2016, the original Paul Newman Daytona had taken on Holy Grail status. Every serious collector knew of its existence, and they knew it hadn’t been seen on his wrist since the mid-eighties. But no one knew where it was. All the speculation only served to deepen the interest around the watch, which fuelled an even greater premium on the price of the other exotic dial models. In May of last year, a later reference sold for $2 million. Newman’s daughter Nell had by this time founded a charitable organization called the Nell Newman Foundation, to carry on her father’s extensive philanthropic work. It’s to help the foundation that Cox, who works as treasurer, has decided to finally sell the watch. Thinking of heading to the auction? Let’s see what you’ll be bidding on. Physically, it’s in great shape for a 45 year-old. That famous dial is completely original and unrestored and the white face has faded to a familiar vintage cream, with a warm patina. All the lume indexes are intact and beautifully aged. There’s no band on the watch; Newman replaced the original steel bracelet and only ever wore it with a three-piece military Fatstrap that’s been lost to the ravages of time. And on the back, still perfectly legible among the scratches of an active life, is the inscription entreating the racer to drive carefully. Paul Newman wearing a Daytona ref. 6239 with an exotic dial. But of course, it’s not the watch that’s being bid on. As far as collectors are concerned, this is the most significant piece of history there is. The esteem in which Paul Newman is held and the place he has in the American psyche make this a momentous event. As an actor, he was as iconic as Brando or James Dean, but his integrity and generosity set him apart. That he gifted the watch so easily to James Cox should come as no surprise for someone who donated every profitable cent from his food line to charitable causes—somewhere in the region of $250 million. As a man, he marched alongside Martin Luther King and was most admired by his children for breaking the top 20 on Nixon’s list of enemies. He was anti showboating, tough and enigmatic. So what else would he wear but a Rolex Daytona?